I started schooling some seven decades ago. It was a Malay school next to our home. At school our classes were often held under the shade of a large tree. Our teacher told us stories and sometimes made us act it out. One of the stories that got imprinted in my mind up to this day is about some blind men trying to figure out what an elephant is like. I am sure many of you reading this article also have heard this same story at some point in your life. Dr. M. Laura Nasi, an integrative oncologist in private practice in Buenos Aires, Argentina. Besides advocating surgery, chemo and radiation as the necessary protocol for cancer, she also embraces certain principles of alternative healing. 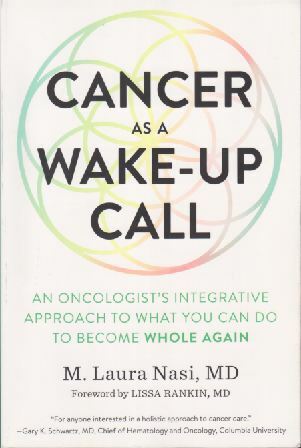 In her book,Cancer as a wake-up call, Dr. Nasi explains her healing protocol. In trying to explain “what is cancer?” she has this illustration. For the first time, I learned that this parable was attributed to The Buddha. The Buddha told a story about six blind men who were asked to describe an elephant. Each man touched a different part of the elephant’s body. They came up with different “perceptions” – one saying it is a pillar, another a rope while another said it is a fan! They argued and defended their “truth” based on what they had “discovered.” Who can blame them — that was what they figured out by feeling for themselves. 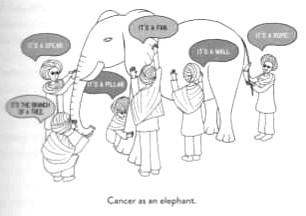 Today, don’t be surprised that cancer is just that elephant in The Buddha’s parable. The surgeons see cancer as a tumour or mass that must be surgically removed — the sooner the better! The oncologists see cancer as a “disease” that can spread or metastatize to other parts of the body. Therefore itmust be “killed” by radiation and/or toxic, chemo-drugs. From the study of genes, cancer is about mutated genes that we inherit from our parents or are damaged by certain factors. Doctors are now using targeted therapies to kill off these mutated cells. Some researchers see cancer as a metabolic disease caused by bad nutrition, toxic chemicals and environment. Therefore they try to use nutrition and supplements to treat cancer. The psychologists see cancer as an out of balance emotional distress. 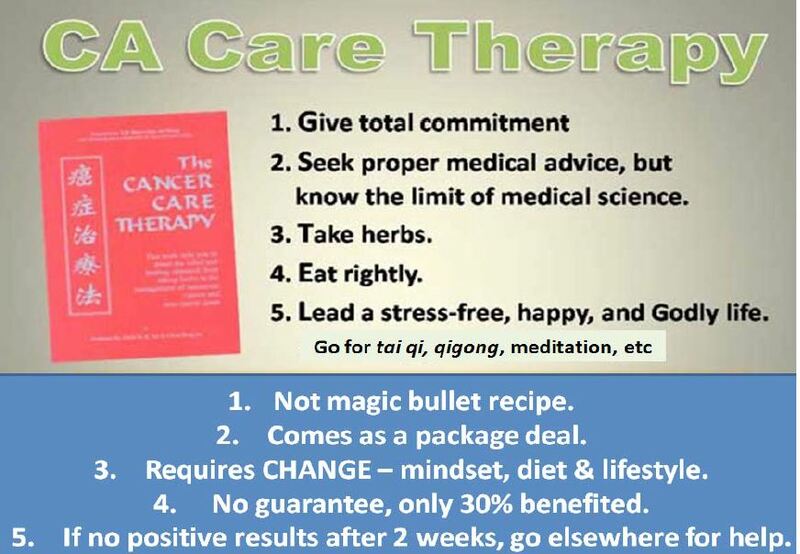 To heal cancer we need to take care of our stress, emotions, relationship with others, etc. etc. Some religious practitioners see cancer as an attack by evil forces that need to be exorcised. This resulted in various forms of faith healings. Like the blind men and the elephant, each perspective probably offers a part of the truth. Take note, it is just a part of the truth not the whole truth! To answer this (question)we need to look beyond what we call cancer and focus on the person. Cancer is a multifactorial disease, more than a genetic, metabolic disorder, more than a psychological, emotional or spiritual imbalance. It is more than just finding a tumour in our body.Autopsies of people who have died in accidents or “from old age” show a high percentage of undiagnosed tumours. And some disappear with no observable treatment at all. The truth is, we produce small tumours all the time that our immune system destroys or keeps under control, and they remain unnoticed throughout our lives. The word cancer embraces hundreds of different diseases … We call them all cancer, but actually they’re a lot of different diseases. Breast cancer is different from skin cancer, and not all breast cancers behave in the same way. Different cancer types and subtypes develop in unique ways and have entirely different prognoses. Some subtypes of lung cancer grow slowly, while others spread quickly. Some respond well to therapy, while others are difficult to treat. Each case is unique, just as each individual is unique. Two people may develop cancer in the same part of the body, but the disease’s progression might vary depending on the response to therapy and the way each person lives the experience. By taking into account different points of view, like the blind people in the story, we can understand the elephant in its wholeness and seek combined strategies that consider the human as a multidimensional being with a body, mind, emotions, spirit and social context. These strategies will include healthy habits – nutrition, exercise and sleep, restoring emotional balance and spiritual reconnection to positively affect the PNIE (psycho-neuro-immuno-endocrine) intelligence network that for so many decades knew how to maintain our health and allow it to play the main role again. That is why cancer, though located in only one organ, is an illness that affects the whole person and not just the affected organ. Hence, the treatment should, from the very beginning, focus on the whole person. The system view paradigm invites us to abandon linear thinking – a single cause for a single effect … It isn’t a mathematical equation where A + B = C. The causes of cancer are usually multifactorial and different for each person. In some people, a combination of unhealthy diet, divorce and losing a job might develop a cancer, while in others it doesn’t. Disappointment was a milestone in my professional life … I was spending time on a project that was dependent on economic factors, people were dying of cancer. I found that deeply unsettling. The paradigm I was immersed in viewed cancer very narrowly and was probably leading us the wrong way.Attempting to discover a cure for cancer only by looking through a microscope at the cells that are part of a tumour seemed myopic. We know there’s a permanent dialogue between cancer cells and the immune system, so how could we suggest a treatment that doesn’t take the person into account, the life challenges they’re facing, and how their emotions might be affecting their well-being? I realized that conventional medicine can play only a limited role in what we call health. I found that to begin to understand why a person got sick, I needed at least a two-hour first consultation. I realized that if I gave enough time to listening, I could help the person see that they already knew what was making them sick. I firmly believe that healing requires looking at people as a whole, helping them become aware of the life they are living and addressing and modifying the things that are making them sick. We encountered a great deal of resistance from other medical sectors in Argentina … it’s not always easy to forge one’s way against convention, but I can’t see any other way to practice medicine effectively. Disease is a message from the soul. Attempting to restore health by attending only to its physical aspects is too limiting. Becoming aware of what’s happening is the first step in bringing about change. Allopathic medicine sees the body as a machine …. the part that isn’t working is removed through surgery and replaced by another one, or the body is given medicine to repair the broken part or at minimum to suppress the symptoms. But we are more than machine. The way we live affects our health. If we eat processed, nutrient-deficient foods, don’t exercise, suffer from sleep disorder, accumulate stress, don’t process emotions, use harmful substances like nicotine or don’t find meaning in our lives, our health is affected. Chronic stress challenges the immune system and makes us vulnerable to diseases. A combination of internal (e.g. anxiety) and external (e.g. divorce, death of loved one, a hostile workplace) is responsible to making us more vulnerable to sickness. Up to 60 percent of cancer cases could be avoided with a healthy diet, regular exercise, stress management and refraining from smoking. We can live a healthier and more balanced life, taking more responsibility for our own well-being. Forty percent of new cancer diagnoses cannot be attributed to unhealthy diets, smoking or sedentariness. Other possible factors include internal conflict, self-criticism and negative self-judgement, emotional instability and existential dissatisfaction. We can’t explain all cases in one way. 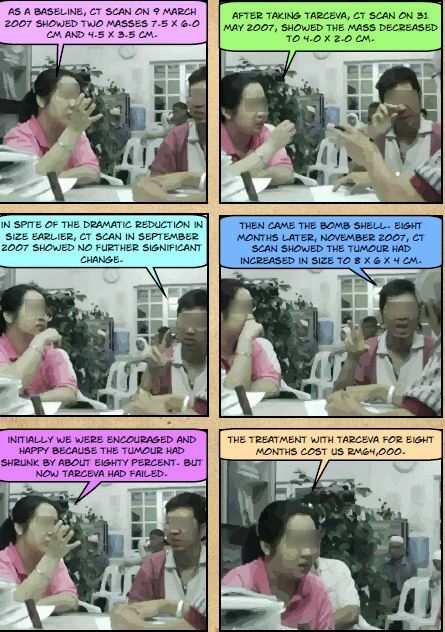 Two cancer patients went to consult their oncologists. 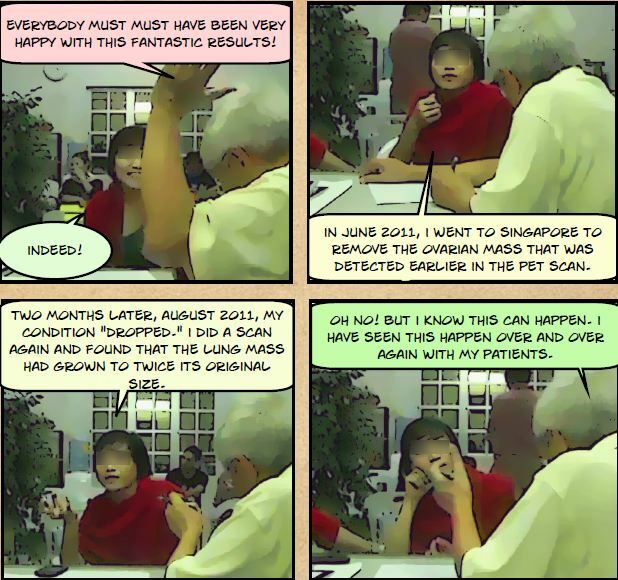 Patient A, with pancreatic cancer, is a Singaporean. She consulted the best oncologist in town. Oncologist: Oh, you stay in Sea View. What are you working as? Patient: I am a forex trader in a bank. Onco: Do you buy health insurance? Oncologist asked patient to lie down. Checked here and checked there. He saw the scans. He put on his computer and showed four patients. 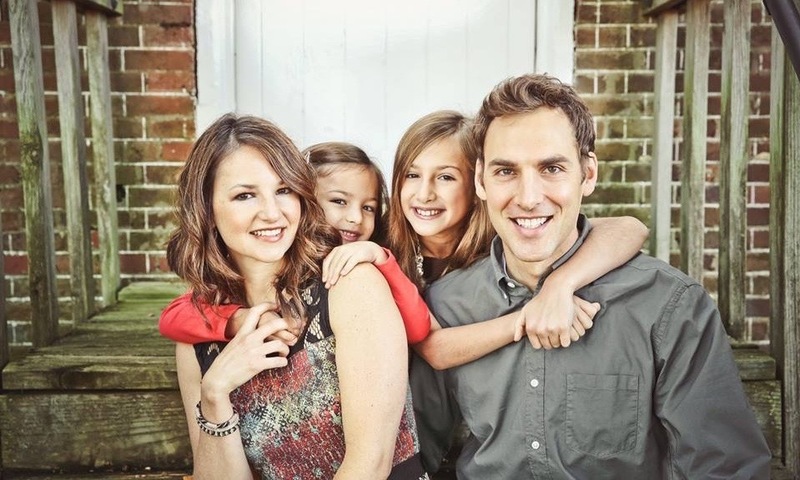 One was a miracle case – he survived 6 years with no sign of cancer coming back. He said there are three types of people that he treated. One type is completely cured. The second type is in remission. The third type is just wasting his time. He is suggesting that I am the type who is wasting his time. Onco: I can’t cure you. Patient: But he asked me to go back and think and decide. Onco: I can start you on chemo. Chemo is every week, for eight times. Husband: What are the side effects. Onco: Nothing. If you go for chemo, you must eat a lot of meat. And we will be generous with the painkiller. Result: Shocked, upset and totally lost. P: He talked to me as if I am just wasting his time. Duration of consultation: Not more than 15 minutes. 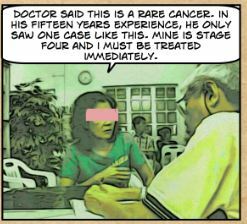 Patient B is a Malaysian who has breast cancer. 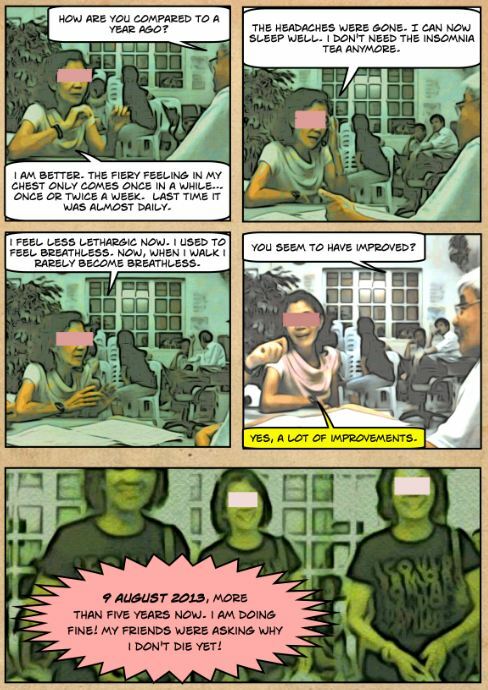 After her surgery, she consulted an oncologist in Penang. Husband: The oncologist talked about money first. Chemotherapy costs RM30,000. 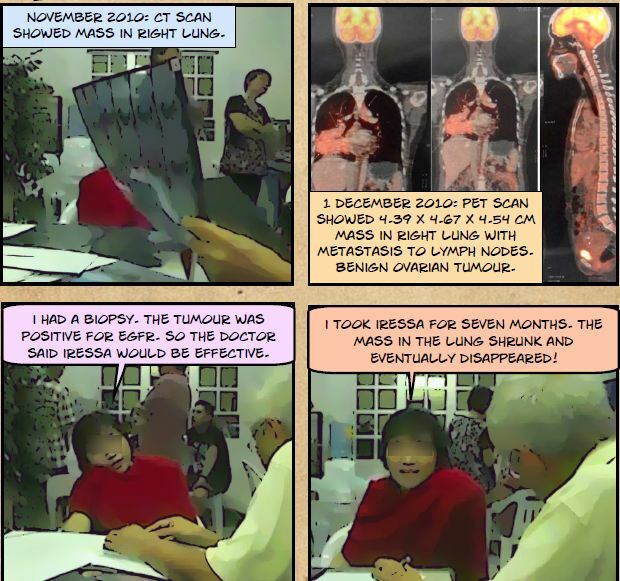 Twenty-five times of radiation costs RM7,000. After that my wife has to take hormonal drug (Femara or Tamoxifen) for five years. This costs about RM700 per month. Since she has a health insurance, they will made sure that all these expenses will be paid for by the Insurance Company. The oncologist looked at the medical report, keyed in some data and read these numbers from his computer. Oncologist: With chemo, the chance of cancer NOT coming back is 75 percent. Without treatment the chance of cancer NOT coming back is 30 percent. Result: Patient not impressed or happy. Duration of consultation: About 10 minutes. Cost of consultation: RM 106. Based on what Dr. Nasi had said, do you think these two patients received the best possible advice for their cancer? Dr. Nasi said for the first visit, she needed a whole two hours to be able to understand her patients’ problems! These oncologists spent 10 –15 minutes “advising” Patient A and Patient B. Do you think their advice really make sense? Whether you go to the best or worst for advice, eventually the most important consideration is the outcome. So what had happened to Patient A? She underwent all the recommended treatments – suffered and died in the hospital even before her chemo was completed. Patient B refused to undergo chemotherapy and radiotherapy. She came to CA Care for help. We spent hours advising her on what to do. 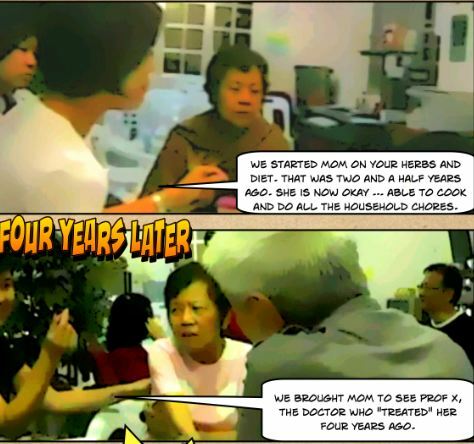 She took herbs, changed her diet, lifestyle and perception about her life. Almost seven years now, as of this writing, Patient B is still alive and well. Why Scientific Peer Review Is A Sham – how scientific is medical research? Today Science is up on a pedestal. A new god has appeared; his high priests conduct the rituals, with nuclear reactors, moon-probing rocket ships, cathode tubes and laser beams. And their territory is sacrosanct; laymen are denied entry. Bruce Cathie in The Energy Grid. Certain sorts of innovation are welcome in science, when they fall within established frameworks and do not threaten vested interests… Dissenters are not welcome. Those who challenge conventional views or vested interests in science are likely to encounter difficulties. Dissenters are likely to be ignored or dismissed. If they gain some recognition or outside support, they may be attacked. What do [scientists] have to gain by spending time helping an outsider? If the outsider has made a genuine discovery, that means the outsider would win rewards at the expense of those already in the field who have invested years of effort in the conventional ideas. Scientists are prone — just like lay people — to being cathected to their pet theories and opinions, especially if they have been visibly rewarded or publicly obtained accolades or financial remuneration as a result. Scientists, like laypeople, have … hefty egos — partially due to their “expertise” and academic titles, qualifications, theories, etc. Once those hefty egos — belonging to people generally known as “experts” — rise to positions of power and/or influence … too many become mere gatekeepers and seek not to facilitate innovation … but to maintain the status quo which got them there in the first place. By definition, anyone who is an ‘expert’ in an area of medicine will be a supporter of whatever dogma holds sway. Students undergo a magical alchemical process as they proceed through educational institutions and emerge transformed from their chrysalis with their doctorates, masters, stethoscopes and equations. They are the Chosen Ones, the purified, the holy, the redeemed, the righteous. They do not have to answer to the lowly non-scientific peasantry – let alone unbelieving heretics. It is simply no longer possible to believe much of the clinical research that is published, or to rely on the judgment of trusted physicians or authoritative medical guidelines. I take no pleasure in this conclusion, which I reached slowly and reluctantly over my two decades as an editor of The New England Journal of Medicine ~ in Drug companies & doctors: A story of corruption. Most “experts” in medicine are, psychologically speaking, simply engaged in well-paid groupthink and confirmation bias exercises, vigorously affirming and defending their ego’s (lucrative) construction of the world. Once the public has accepted the scientific establishment’s truths, narratives, and designated “experts” then researchers who yield findings deviating from the accepted norm can be immediately branded as crackpots, lunatics, fringe nuts, pseudo-scientists and so on. primarily a marketing machine and co-opting every institution that might stand in its way. Most research findings are false for most research designs and for most fields. A lot of what is published is incorrect.” I’m not allowed to say who made this remark … The case against science is straightforward: much of the scientific literature, perhaps half, may simply be untrue. Afflicted by studies with small sample sizes, tiny effects, invalid exploratory analyses, and flagrant conflicts of interest, together with an obsession for pursuing fashionable trends of dubious importance, science has taken a turn towards darkness … “poor methods get results”. When you hear about new medical breakthroughs in the news, you will only hear about peer reviewed research. Peer reviewed means that it passed some sort of basic standards for quality. It is the gold standard of research. But is it real gold, or fool’s gold? Medical research seems especially mystical and awe inspiring to the average person. The basic concepts of medicine … are deliberately cloaked in Latin terminology and other confusing jargon, making medical knowledge and theory seem out of reach to the common person. After all, every profession needs to make you think you need their services. Lawyers make the legal system so complex and confusing that the average person is completely helpless without legal assistance. Doctors have made it so you cannot request medical tests or take drugs without their prescription. You name a profession, and you can see ways it perpetuates itself by disempowering the public. What about the medical research profession? Researchers make their money usually from both salaries and grants. The job of the researcher is to find a sponsor for their special type of research. The more research projects and publications they get, the more sponsors they have, and the higher their income. And if a researcher comes up with a patentable device or drug, there are intellectual property rights to throw into the compensation package. This means that researchers do not work for free. They are mercenary. Most of the money for medical research comes from the private sector, usually drug companies, which is why drugs dominate modern medicine. They care much more about the treatment than the cause, since treatment is profitable for the research sponsors, while knowing the cause can lead to prevention, which translates in medical terminology into “unbillable”. Since most people have been conditioned into believing that they cannot judge medical research unless they have a Ph.D., M.D., N.D., or other license, the research is evaluated for you by other scientists in the field. This is called peer review. Scientists doing research, as with all professions, belong to a club of like-minded researchers in the same business, promoting their services and products. They belong to the same kinds of industries, such as universities or large multinational drug corporations. They have the same education, which means they all think alike. The purpose of their organization is to provide standards of practice that are supposed to assure quality. Any research must first be somehow reviewed by the peers of this club to make sure the quality guidelines are met, before the research can be published. Yet, despite this assurance of quality, the fact is that most of what is considered true today will be discarded as false in the future. “Ninety percent of what you learn in medical school will be out of date and considered obsolete in ten years,” we were told by the dean of students when I began medical school. This means that most of what doctors learn is wrong. It also means that the new information which will come in 10 years to replace and update current misconceptions and errors will also be considered obsolete in another ten years’ time. … Most drug research is paid for by the companies that produce and profit from those same drugs. Even research testing drug side effect hazards is paid for by the companies standing to lose, big time, if their drugs are proven unsafe. Since drug companies have their bottom line, and not unselfish service to mankind, … it is extremely unwise to trust them with research into their own products. Researchers take no oaths of honesty or integrity. They work for whoever pays them, and they are not above fudging the results to get the desired outcome. This is not good science, of course. Medical research is about making money coming up with newly patented drugs to replace the ones that have just gone off-patent and are being sold too cheaply by generic drug competitors. Peer review also keeps out alternative theories and ways of doing research. All innovation threatens the status quo, and those who control the peer review process, like Supreme Court Justices, can decide on which cases to hear and which to ignore. They are gatekeepers of the status quo, which keeps the current powers that be in power. Since the medical peer review boards are the culture’s final authority on quality, there is no way to challenge their decisions. Any researcher will tell you that lots of bad research is done that gets published. Since researchers and their peers are all caught in this same publish or perish demand, and review one another’s work, they subtly collude to get as much research as they can funded and published. You scratch my back and I’ll scratch yours … there is overall an understanding that, as peers, united they stand and divided they fall. Of course, this means that peer review is nothing more than a political arrangement for research workers, like a guild or union. It’s goal is to keep control over their field, suppress the competition, and assure continued cash flow. It has nothing to do with science. So the next time you hear a news story about some new wonder drug, look for the union label. If it is peer reviewed, there’s a ninety percent chance it’s wrong. Indeed, most doctors take money or gifts from drug companies in one way or another. Many are paid consultants, speakers at company-sponsored meetings, ghost-authors of papers written by drug companies or their agents,4 and ostensible “researchers” whose contribution often consists merely of putting their patients on a drug and transmitting some token information to the company. Still more doctors are recipients of free meals and other out-and-out gifts. In addition, drug companies subsidize most meetings of professional organizations and most of the continuing medical education needed by doctors to maintain their state licenses. No one knows the total amount provided by drug companies to physicians, but I estimate from the annual reports of the top nine US drug companies that it comes to tens of billions of dollars a year. By such means, the pharmaceutical industry has gained enormous control over how doctors evaluate and use its own products. Its extensive ties to physicians, particularly senior faculty at prestigious medical schools, affect the results of research, the way medicine is practiced, and even the definition of what constitutes a disease. Consider the clinical trials by which drugs are tested in human subjects.5 Before a new drug can enter the market, its manufacturer must sponsor clinical trials to show the Food and Drug Administration that the drug is safe and effective, usually as compared with a placebo or dummy pill. The results of all the trials (there may be many) are submitted to the FDA, and if one or two trials are positive—that is, they show effectiveness without serious risk—the drug is usually approved, even if all the other trials are negative. Drugs are approved only for a specified use—for example, to treat lung cancer—and it is illegal for companies to promote them for any other use. But physicians may prescribe approved drugs “off label”—i.e., without regard to the specified use—and perhaps as many as half of all prescriptions are written for off-label purposes. Since drug companies don’t have direct access to human subjects, they need to outsource their clinical trials to medical schools, where researchers use patients from teaching hospitals and clinics, or to private research companies (CROs), which organize office-based physicians to enroll their patients. Although CROs are usually faster, sponsors often prefer using medical schools, in part because the research is taken more seriously, but mainly because it gives them access to highly influential faculty physicians—referred to by the industry as “thought-leaders” or “key opinion leaders” (KOLs). These are the people who write textbooks and medical journal papers, issue practice guidelines (treatment recommendations), sit on FDA and other governmental advisory panels, head professional societies, and speak at the innumerable meetings and dinners that take place every year to teach clinicians about prescription drugs. Having KOLs … on the payroll is worth every penny spent. A recent survey found that about two thirds of academic medical centers hold equity interest in companies that sponsor research within the same institution.6 A study of medical school department chairs found that two thirds received departmental income from drug companies and three fifths received personal income. Because drug companies insist as a condition of providing funding that they be intimately involved in all aspects of the research they sponsor, they can easily introduce bias in order to make their drugs look better and safer than they are. Before the 1980s, they generally gave faculty investigators total responsibility for the conduct of the work, but now company employees or their agents often design the studies, perform the analysis, write the papers, and decide whether and in what form to publish the results. Sometimes the medical faculty who serve as investigators are little more than hired hands, supplying patients and collecting data according to instructions from the company. In view of this control and the conflicts of interest that permeate the enterprise, it is not surprising that industry-sponsored trials published in medical journals consistently favor sponsors’ drugs—largely because negative results are not published, positive results are repeatedly published in slightly different forms, and a positive spin is put on even negative results. The suppression of unfavorable research is the subject of Alison Bass’s engrossing book, Side Effects: A Prosecutor, a Whistleblower, and a Bestselling Antidepressant on Trial. This is the story of how the British drug giant GlaxoSmithKline buried evidence that its top-selling antidepressant, Paxil, was ineffective and possibly harmful to children and adolescents. Bass, formerly a reporter for the Boston Globe, describes the involvement of three people—a skeptical academic psychiatrist, a morally outraged assistant administrator in Brown University’s department of psychiatry (whose chairman received in 1998 over $500,000 in consulting fees from drug companies, including GlaxoSmithKline), and an indefatigable New York assistant attorney general. They took on GlaxoSmithKline and part of the psychiatry establishment and eventually prevailed against the odds. One clue was provided six years ago by four researchers who, using the Freedom of Information Act, obtained FDA reviews of every placebo-controlled clinical trial submitted for initial approval of the six most widely used antidepressant drugs approved between 1987 and 1999 — Prozac, Paxil, Zoloft, Celexa, Serzone, and Effexor.10 They found that on average, placebos were 80 percent as effective as the drugs. The difference between drug and placebo was so small that it was unlikely to be of any clinical significance. The results were much the same for all six drugs: all were equally ineffective. But because favorable results were published and unfavorable results buried (in this case, within the FDA), the public and the medical profession believed these drugs were potent antidepressants. Clinical trials are also biased through designs for research that are chosen to yield favorable results for sponsors. For example, the sponsor’s drug may be compared with another drug administered at a dose so low that the sponsor’s drug looks more powerful. Or a drug that is likely to be used by older people will be tested in young people, so that side effects are less likely to emerge. In short, it is often possible to make clinical trials come out pretty much any way you want. Conflicts of interest affect more than research. They also directly shape the way medicine is practiced, through their influence on practice guidelines issued by professional and governmental bodies, and through their effects on FDA decisions. In recent years, drug companies have perfected a new and highly effective method to expand their markets. Instead of promoting drugs to treat diseases, they have begun to promote diseases to fit their drugs. The strategy is to convince as many people as possible (along with their doctors, of course) that they have medical conditions that require long-term drug treatment. Sometimes called “disease-mongering,” this is a focus of two new books: Melody Petersen’s Our Daily Meds: How the Pharmaceutical Companies Transformed Themselves into Slick Marketing Machines and Hooked the Nation on Prescription Drugs and Christopher Lane’s Shyness: How Normal Behavior Became a Sickness. To promote new or exaggerated conditions, companies give them serious-sounding names along with abbreviations. Thus, heartburn is now “gastro-esophageal reflux disease” or GERD; impotence is “erectile dysfunction” or ED; premenstrual tension is “premenstrual dysphoric disorder” or PMMD; and shyness is “social anxiety disorder” (no abbreviation yet). Note that these are ill-defined chronic conditions that affect essentially normal people, so the market is huge and easily expanded. Melody Petersen, who was a reporter for The New York Times, has written a broad, convincing indictment of the pharmaceutical industry.16 She lays out in detail the many ways, both legal and illegal, that drug companies can create “blockbusters” (drugs with yearly sales of over a billion dollars) and the essential role that KOLs play. Her main example is Neurontin, which was initially approved only for a very narrow use—to treat epilepsy when other drugs failed to control seizures. By paying academic experts to put their names on articles extolling Neurontin for other uses—bipolar disease, post-traumatic stress disorder, insomnia, restless legs syndrome, hot flashes, migraines, tension headaches, and more—and by funding conferences at which these uses were promoted, the manufacturer was able to parlay the drug into a blockbuster, with sales of $2.7 billion in 2003. The following year, in a case covered extensively by Petersen for the Times, Pfizer pleaded guilty to illegal marketing and agreed to pay $430 million to resolve the criminal and civil charges against it. A lot of money, but for Pfizer, it was just the cost of doing business, and well worth it because Neurontin continued to be used like an all-purpose tonic, generating billions of dollars in annual sales. er their other properties, are sedating, and nearly all of which have potentially serious side effects. Physicians are also led to believe that the newest, most expensive brand-name drugs are superior to older drugs or generics, even though there is seldom any evidence to that effect because sponsors do not usually compare their drugs with older drugs at equivalent doses. In addition, physicians, swayed by prestigious medical school faculty, learn to prescribe drugs for off-label uses without good evidence of effectiveness. It is easy to fault drug companies for this situation, and they certainly deserve a great deal of blame. Most of the big drug companies have settled charges of fraud, off-label marketing, and other offenses. Physicians, medical schools, and professional organizations have no such excuse, since their only fiduciary responsibility is to patients. The mission of medical schools and teaching hospitals—and what justifies their tax-exempt status—is to educate the next generation of physicians, carry out scientifically important research, and care for the sickest members of society. It is not to enter into lucrative commercial alliances with the pharmaceutical industry. As reprehensible as many industry practices are, I believe the behavior of much of the medical profession is even more culpable.19 Drug companies are not charities; they expect something in return for the money they spend, and they evidently get it or they wouldn’t keep paying. 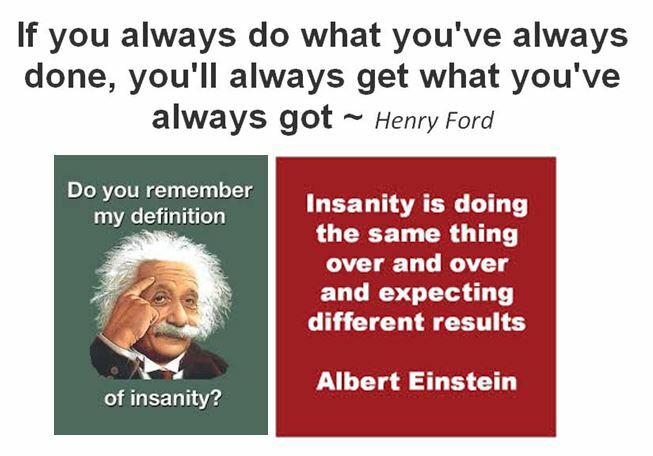 So many reforms would be necessary to restore integrity to clinical research and medical practice …. Members of medical school faculties who conduct clinical trials should not accept any payments from drug companies except research support, and that support should have no strings attached, including control by drug companies over the design, interpretation, and publication of research results. Medical schools and teaching hospitals should rigorously enforce that rule, and should not enter into deals with companies whose products members of their faculty are studying. Finally, there is seldom a legitimate reason for physicians to accept gifts from drug companies, even small ones, and they should pay for their own meetings and continuing education. After much unfavorable publicity, medical schools and professional organizations are beginning to talk about controlling conflicts of interest, but so far the response has been tepid. They consistently refer to “potential” conflicts of interest, as though that were different from the real thing, and about disclosing and “managing” them, not about prohibiting them. But if the medical profession does not put an end to this corruption voluntarily, it will lose the confidence of the public. “To leave no stone unturned” is an idiom that means to do everything possible to find something or to solve a problem. At age 43,in 2007, Dorit was diagnosed with Stage 2 breast cancer. The doctor assured her that the cancer was likely to be suppressed after surgery, radiotherapy (28 sessions) and six months of chemotherapy. It was not to be. Less than two years after the medical treatments the cancer recurred in her backbone. Dorit underwent surgery and radiotherapy again. And again the cancer came back after three years. She was again treated with radiation. A year later, the cancer recurred for the fourth time — it is now defined as Stage 4. She suffered severe abdominal pain, nausea and severe weight loss. Perhaps enough is enough? 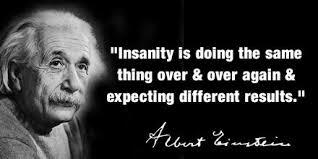 Remember what Albert Einstein said? Dorit decided to investigate non-conventional ways of dealing with the disease. 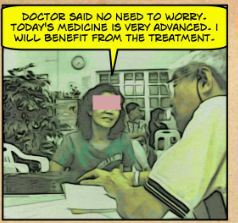 She said, I find it hard to understand why people turn to alternative medicine so late. If it’s a result of ignorance, then I will now contribute my share to the mass of knowledge. Perhaps it is due to a prejudice that only doctors and drugs can resolve health problems. Dorit decided to know more about alternative treatments for cancer. For three months, day and night, I sat at the computer and read stories of American survivors. I crossed-referenced my information and searched for articles that confirm the effectiveness of the substance they take. In her face book she posted a notice asking cancer survivors in Israel to share their experiences. She said, In doing so, you will encourage others … In other words, you can help save the lives of cancer victims — perhaps a new one every day! Thus I began my search …. it was not an easy task. To start with, here are some inspiring words that inspired Dorit. You deserve to be healthy. You are blessed beyond your wildest dreams ~ Luoise Hay. We take 100 percent responsibility over our lives, acquiring the power to release and fix things that are stuck in our lives ~ Ho’oponopopo method of healing. Severe emotional events could remove an organ from the right frequency, hindering its optimal functioning. That’s when a disease appears ~ Hamer, New Medicine. If you get cancer, know that you can live with it in harmony for years. Living with cancer in perfect health ~ Gershom Zajicek. In this book, Dorit shared the experiences of her cancer journey. In addition, she documented the healing stories of 28 other people who survived their cancers. They are “heroes” and they are unique in their own ways solving their life’s challenges BUT they showed some basic similarities. Taking responsibility of your own health. If you don’t help yourself no one can help you. You reap the consequences of your decisions and actions. Change of diet is essential to your healing. Eating only natural, unprocessed foods and removing sugar from the menu. Using herbs and dietary supplements – plants have tremendous healing power. Following your intuition. Use your heart not your head to be constantly attentive to what’s right for me and makes me feel good. Letting go of repressed emotions – even if it seems everything is fine now, there are some things from my past that I should process, deconstruct, and let go. Living a full life with cancer. Elevating positive emotions on a daily basis – constantly searching for what I already have, what’s good, what pleases me, and what I’m thankful for. Always acknowledging what’s good in my life. Getting help – I have learned and still learn every day how important it is to ask people for help and to tell those dearest to me about the path that I chose, in regards to physical aspects and when making decisions about various treatments. I am glad that Dorit had found the path to her healing. She tried medical treatments thrice — surgery, chemo and radiation. Thrice she failed. 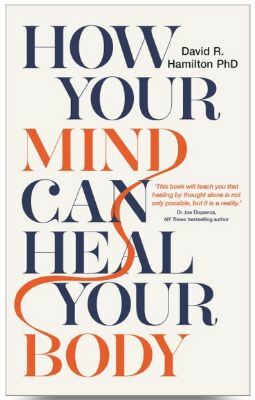 She decided to look at the “other side” (the so call unproven, unscientific, quackery) and Dorit found healing and survived to write this book. Her path to healing is not easy. She put in her heart and soul to make her well and she was well rewarded. Success does not come to patients who are only interested in easy “handouts” by just sitting under a coconut tree hoping for some magic potions to fall from the sky. Dorit worked hard, day and night with full commitment to find her healing. And she found it. I salute her. I recommend that you read her book. You can get it from amazon.com. I admired her desire to share what she learned with others. How many of us want to “waste” time doing that? I once told a cancer patient, By sharing and helping others you also cure yourself. From my own experience, by talking with patients and writing their stories, I too benefit and learn to heal my life. It is more blessed to give than to receive! We started CA Care in 1995 — more than two decades ago. At that time I knew nothing about cancer. I did not even know the difference between radiotherapy and chemotherapy! I started with a blank slate. I read and read. 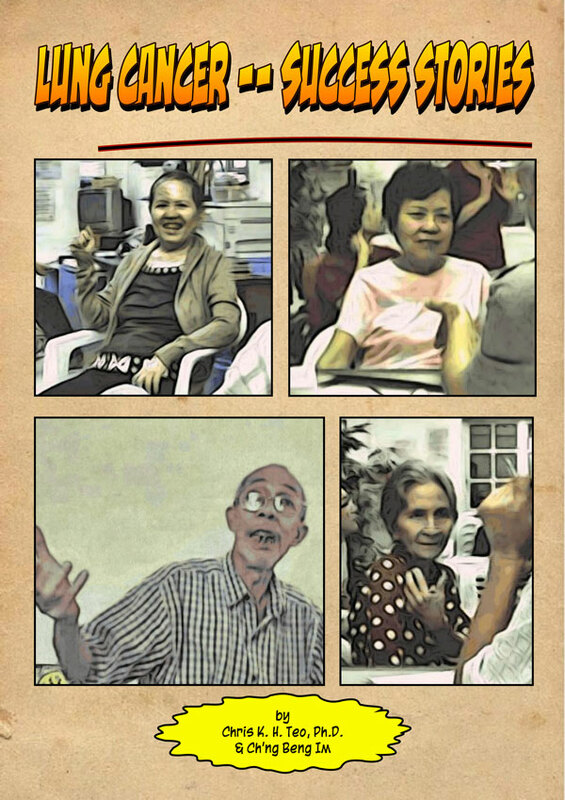 I talked to cancer patients who are really my teachers. With time, I learned a lot and later could write more than a dozen books on the subject. There over 600 articles in our website and almost 900 videos in YouTube. And I have not stopped learning. I am still reading and writing. The CA Care Therapy which we advocated some twenty-years plus ago benefited many patients. The journey we went through was very much like Dorit’s journey in Israel. The language of healing is universally the same, no matter where you are on this planet. If you are sincere and honest in wanting a find a solution to cancer, you don’t need to be a rocket scientist. You don’t have to go to a medical school. Just read and use your commonsense and you can come up with a near correct answer. Dorit is a artist. 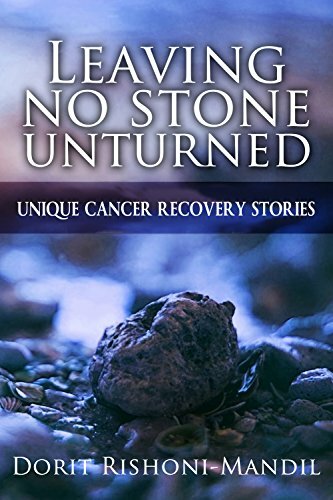 When she had cancer she went through surgery, chemo and radiation which did not cure her. In short, she learned life’s lesson the hard way. After a few months of intense reading, talking and researching she found something to save and prolong her life. And yet for many, they are we still saying that medical treatment is the only answer to cancer! Wake up, please. The MINDACT phase 3 clinical trial involved nearly 6,700 women at 111 medical centers in nine countries. The shocking results of the long awaited MINDACT clinical trial are in. Many breast cancer patients have been receiving chemotherapy treatments they didn’t need. And that chemotherapy made no difference in their survival. After surgery to remove their tumors, early-stage breast cancer patients (0-3 positive nodes) with a MammaPrint score recommending against chemotherapy had a 95% survival rate. This free guide could save your life. The first oncologist I saw didn’t tell me the risks, lied to me about the success rate, and told me I was “INSANE” if I didn’t do what he recommended. I was afraid that I had no other options, but my wife and I accidentally asked two questions that in hindsight helped save my life…. Doctors aren’t telling patients everything they need to know, and patients don’t know the right questions to ask. Like I said, my wife and I accidentally asked two questions that helped save my life. The truth is your compass. With it, you can make an informed decision, and chart your course of treatment with confidence. Without the truth, you are like a ship lost at sea, hoping and praying you’re headed in the right direction… Sadly, this is the position that many cancer patients find themselves in, because they didn’t ask the right questions in the beginning. Your next steps could be critical to your survival, or the survival of someone you care about. Don’t let fear, uncertainty and helplessness influence the decision-making process. Get the guide. Let us look at more research articles on this often neglected subject of treatment for near death patients. We have previously shown that the aggressive use of chemotherapy in patients who are close to death has been increasing over time. In fact, aggressive approach to treatment during the last week of life is linked to psychological and physical distress for advanced cancer patients. Other studies have also shown that chemotherapy use during near death irrespective of the cancer’s responsiveness to therapy has been associated with potentially negative effects, including higher numbers of emergency room (ER) visits, hospitalizations, and admissions to the intensive care unit (ICU), and less hospice service. These results beg the question of whether aggressive care leads to improved outcomes. Using the Surveillance, Epidemiology, and End Results-Medicare database, we identified 7,879 Medicare-enrolled patients aged 65 or older who died after having survived at least 3 months after diagnosis of advanced non-small cell lung cancer (NSCLC) between 1991 and 1999. Receipt of chemotherapy was associated with a 2-month improvement in overall survival. However, based on three different statistical approaches, no additional survival benefit was evident from continuing chemotherapy within 14 days of death. Conclusions: 1. We could not detect a benefit in survival from continuing chemotherapy close to death. Continuing chemotherapy for advanced NSCLC until very near death is associated with a decreased likelihood of receiving hospice care but not prolonged survival. Conclusion 2. Oncologists should strive to discontinue chemotherapy as death approaches and encourage patients to enroll in hospice for better end-of-life palliative care. Patients with cancer lose many things of importance. As soon as they hear the words “you have cancer,” they lose control over their lives, as medical appointments immediately begin to shape their daily schedules. They may lose the ability to participate in activities that bring them joy, as a result of chronic treatment adverse effects such as neuropathy, bowel issues, or lymphedema. Too many lose their lives. We also commonly hear the statement that a patient has lost “his or her battle” with cancer. Since President Nixon declared a “War on Cancer” back in 1971, many have used some variant of the term battling cancerin describing all sorts of oncologic treatment, from undergoing locoregional therapies such as surgery and/or radiation therapy, to seeking systemic chemotherapies or biologic therapies, and even pursuing alternative regimens. This is particularly common in advertising campaigns for hospitals or oncology programs. 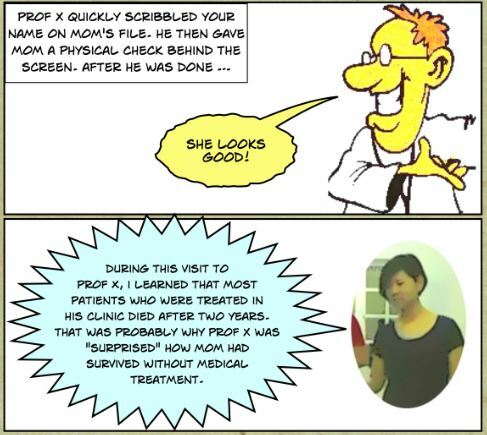 Almost daily we experience some written or broadcast news story on a patient wholost his or her battle with cancer. 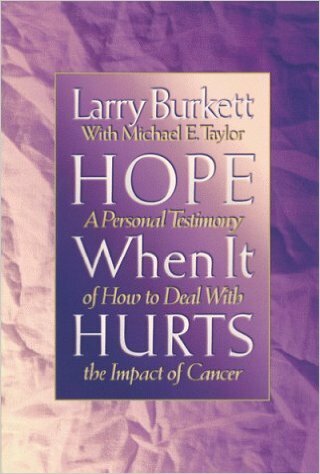 However, we wish to revisit this topic because there is the need to explain that receiving a diagnosis of cancer should not deny anyone their dignity; no one with cancer should be considered a “loser” in any way during the course of neoplastic disease, including those patients who die of their cancer or effects of their therapy. Using the battle metaphor implies that if a patient fights hard enough, smart enough, and/or long enough, he or she will be able to win the war. Unfortunately, and with rare exceptions, patients with metastatic cancer cannot conquer cancer (win the “war”) no matter how hard they fight. We have far too few effective curative treatments and interventions. We can celebrate occasional long-term survivors, but for the most part, we do not know why one person is alive 15 years after the diagnosis of advanced cancer, whereas another dies 9 months after the diagnosis. Patients with “curable” disease are cured because treatment eradicates every last cell, not because the patient did or did not somehow fight valiantly. Once someone receives a cancer diagnosis, especially advanced-stage disease, a journey begins; sometimes the journey requires patience, tolerance, and courage, but at some point, most patients with advanced disease end that journey with loss of life. Although this difficult and tumultuous journey may have come to an end, dying should not be viewed as being defeated in some kind of skirmish. Many patients themselves adopt the battle metaphor when they receive the diagnosis. If one needs to assume a warlike attitude to face the challenges of cancer, so be it; anything goes in helping a patient (and his or her family) cope during this journey. We have all had the experience of patients stating (paraphrased) “I want curative treatment, not palliative treatment, because I’m going to beat this thing.” The litany of imaging, appointments, examinations, blood sampling, pills, infusions, surgery, and radiation treatments can make a patient feel as if he or she has been in a fight. However, thinking about it from a different perspective, the use of the battle metaphor implies a level of control that patients simply do not have. When we talk about the “battle,” we minimize the real issues faced by patients every day. Patientsdeal with and sometimes overcome nausea, pain, fatigue, and weight loss. They suffer the isolation that comes with a diagnosis. For those with potential curative disease, theylive with the fear of recurrence and impact of chronic adverse effects. Unless you have been in their shoes, it is often hard to imagine the challenges faced every day by our patients, and we oftentimes do not fully credit patients for their persistence and resilience in their journey. Let us recognize them for all the challenges that they overcame in their journey. Let us not declare themlosers at the end of this journey. Similarly, the continuous urge to win the battle extends to oncologists, who actively treat patients for too long. The fact is that 8% of patients receive chemotherapy within 2 weeks of dying of cancer, and 62% within 2 months. Late chemotherapy is associated with decreased use of hospice, greater use of emergency interventions (including resuscitation), and increased risk of dying in an intensive care unit vs at home.This all clearly reflects our society’s need to battle until the end. But let us take a closer look at this mentality. Most of our therapies are toxic: they cause depression of the immune system, fatigue, rash, nausea, vomiting, neuropathy, and so forth. In addition, in today’s insurance landscape, many of our therapies can lead to financial toxicity. Patients are willing to deal with these adverse effects as a trade-off for “hope”— but are we honest with them about the true potential benefit of the treatment? For many therapies, there is little evidence that life is substantially prolonged. We have seen patients who are determined to win their battle. As they turn from treatment to treatment, they are not spending time with loved ones; rather, they are chasing the illusive “win,” a path that affects not only them but also their family and caregivers, as well as family finances. 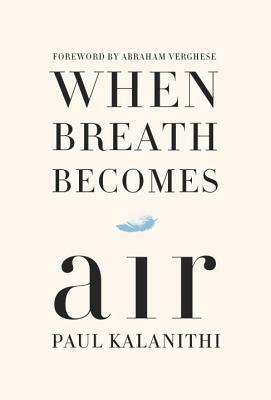 There are patients who face their mortality with clear eyes and, yes, courage. They make choices and can opt to die on their own terms: they can choose to die without a drug-induced rash, diarrhea, or fatigue. They may also choose to spend their remaining time doing what they wish, without an intravenous line or infusion port. They may choose not to be confined to weekly infusions and repeated blood sampling and imaging. Or did she choose to control how she spent her final days? We would venture to say that she made an informed, reasoned decision to say “no more”—no more pain, no more marginal treatment, no more treatment-induced adverse effects: no more! Of course, the choice to end one’s treatment and even one’s life … belongs with the patient. The patient’s decision is informed by their health, their family, their belief system, and, from a pragmatic point of view, their location. We firmly believe that health care professionals owe their patients the difficult and honest discussions that come as patients grapple with their mortality. We also believe that patients’ decisions should be honored and supported by their health care team. Let us respect patients who are already suffering from the effects of cancer and cancer-related therapy. We will all die one day; perhaps the winner … the person who does it under his or her own terms; the person who dies peacefully and not at war. Indeed the above are well-written articles by doctors and scientists. Of course, the world view is that if you have cancer, you need all these stuff — surgery, chemo and radiation or other expensive toxic drugs. Other world views are a no, no — unproven and unscientific, quackery, snake oil, etc. etc. But, after having helped hundreds and hundreds of cancer patients over the past 20 years with our CA Care Therapy, we have enough evidence to show that non-medical ways to manage cancer, in some cases, are just as effective if not MORE effective, MORE humane and MORE cost effective than the present day chemo and radiation. Why don’t we explore these alternatives? A taboo question indeed to the medical fraternity. At CA Care, we tell patients. “Learn to live with your cancer.” Cancer is not your enemy. So there is no need to wage a war. In war, nobody wins. 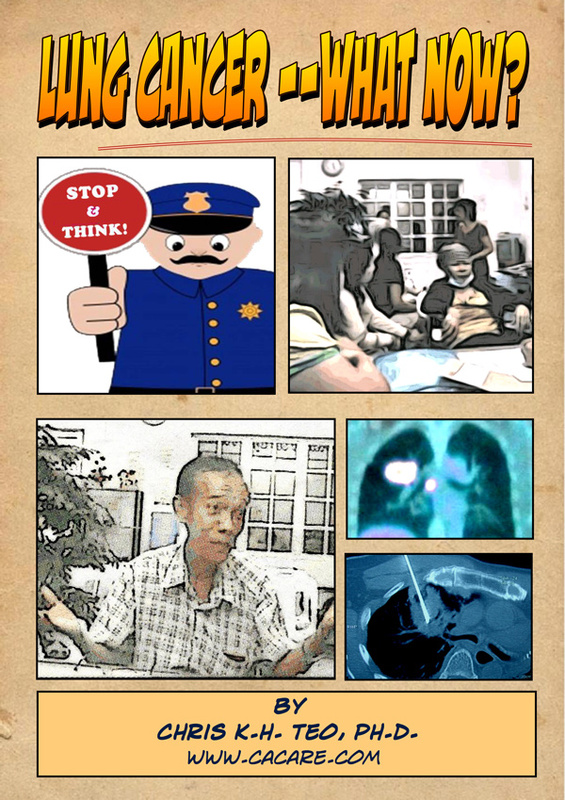 We also tell patients, Everybody has to die — it does not matter if you have cancer or not. So, death is not an issue but a certainty. The important point to consider is how you want to die when the times comes. Don’t die suffering, stripped off human dignity. If you can eat, can sleep, can move about and have no pain … consider yourself blessed. Don’t ask for more. We are indeed very glad to know that most of our patients die in peace without suffering. They also don’t die because of “treatment toxicity” and /or “financial toxicity”. 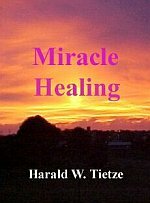 Here are some interesting quotes from Miracle Healing, a book written by Harald W. Tietze of Australia. Reflex on these words …. I have to say that there is no other medicine, modern or traditional, as powerful as the healer within — the mind. When I talk about old healing methods and get questions such as “where is the scientific proof?”, I only can answer that it is not the patient’s main concern how it works but THAT it works. Ill people cannot wait until science can explain why it works. There was a wrong diagnosis. We do not understand how this could happen. Continue with whatever you are doing, but when the patient wants to tell WHAT they do, the doctor is not interested. Fifty to 70 percent of hospital beds are occupied by patients with self-inflicted diseases like “suicides” with fork and knife. Miracle healing can be done by changing the contents of shopping trolley. One method of “miracle healing” for the majority of modern diseases is better EDUCATION instead of Medication. Dear reader! This book was only written for people who can think and practise the same. They belong to a dwindling minority. Your thinking is … indispensable if you want to gain some value from this book. Neither should you read (this book) when you are determined not to change yourself. From whom can you expect help in receiving or restoring your health? The book tells you that in this world there is only one person who is both interested and capable of doing this. That only person is you yourself! Medicine does not have that capacity. Quite apart from the fact that such is its job. The task of medicine is to alleviate suffering. Its main concern and its business is illness, not health. You have to look after your own health. Your health or disease is solely your own creation. Are you willing to do something active during healthy times to maintain good health? Almost 80 percent of people … will answer NO to the question. They said: No, I will do something for my health only when I am sick. Why? Because our consumer-society tells us that we can buy health from medical specialists through a pharmacist like we can buy bread and sugar from the grocery store. That is nonsense. Each individual has to work strongly on his own health. Since there are almost no active medicines which at the same time have no negative side effects, medicines should only be prescribed or taken if it is absolutely necessary. Unnoticed, an industry that was created to heal diseases became a source of new diseases. According to the FDA 1.5 million Americans were treated in hospitals for diseases caused by medications. The death caused by medication are estimated to be from 60,000 to 140,000 in the USA each year. The medical industry thrives on suffering due to disease. If the suffering is lowered, the basis of this industry is threatened. It would be equally foolish for medicine — which is today an industry like any other — to expect protection from disease or cure. One can compare this to companies who produce razor blades that never go blunt. Health is Balance in Mind, Body and Spirit. If we treat only one part of the body, the mind or the spirit, we are not successful in the long-term. I do not know why churches turn their back on facts. For example, in the Bible herbal treatments are mentioned approximately 3000 times. Do, for example, Christians as followers of the Bible, hear anything about health treatments when they go to church …..
Or do you get from your psychologist advice on diet and other means of gaining health? How can anyone specializing on one small aspect help a person by overlooking nearly the lot? Health is not only a “clean bill of health” issued by the doctor! Disease starts in the mind and becomes only “visible” after it is manifested and displays symptoms. Treating the symptoms does not heal. For long-term healing YOU have to work for it, nobody else can do it for you.